Since their final loss against Portugal, the French road to the World Cup was very convincing, especially against Germany (2-2), which showed how France can play more complex football than what we could see during the Euro. Although the teams they faced in World Cup playoff were not very dangerous (Belarus, Bulgaria, Holland, Sweden, and Luxembourg), Didier Deschamps’s squad showed that they can be a serious favourite for the competition. However, defeat against Sweden and then the draw against Luxembourg also showed that there are still improvements to be made. 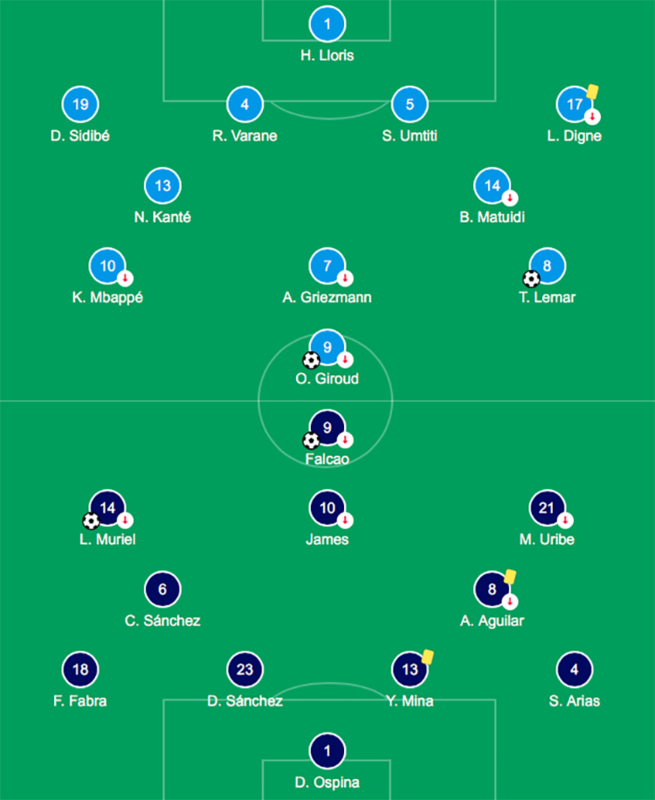 Last game against Columbia only confirmed those troubles: after leading 2-1 at the 28th minute, France collapsed in the second half (they lost 2-3) with both lacks of desire and tactical weakness, two essential things at such a high level and especially in view of the World Cup. While French came to this game with some doubts on injuries (Pogba, Tolisso, Lacazette or Koscielny) the squad is still composed by efficient players such as Griezmann, Kante, Umtiti, Varane or Lloris. With a midfield composed by Kante, Matuidi and Lemar ahead of the two stamina players, the offensive part of the team seemed quite balanced with Griezmann playing around Giroud (like usual) and Mbappe as a provocative winger, Lemar playing more as the main playmaker. While it’s easy for Deschamps to compose with centre-backs (either Koscielny, Varane, Umiti or even Kimpembe), it’s more difficult to choose among left and right backs. On the left, it’s usually Kurzawa that fill the position but his recent performances in PSG were not very good and so the French manager preferred to choose Digne who is very efficient both in Barcelona and when he was called in to the national team. With Sidibe on the right, it is easier while the Monaco player is a bit higher in the hierarchy than a potential substitute (mainly Jallet or Pavard). During the first half, the French performed a strong press on the opponent. Pictures below show how the whole block on the side where the ball is located is concerned. And finally, Digne get the ball back, helped by Matuidi. This pressing is even more effective with the laterals positioned very high as can be seen on the passnetwork below. This good pressure resulted in two early goals (11’ and 26’) for the French. On the breaking pass that ends on the first goal, we can see how Colombia is passive, though quite well aligned. When teams come back to dressing rooms, France were already showing signs of a tactical weakening with centre-backs and midfielder that have difficulties in the first pass that bring dangerous actions and a drop in the pressing. In fact, Colombia started their game during the beginning of the second half, with a much more intensive pressing and players like James Rodriguez and Falcao who shone at perfect times. On the other hand, the French seemed tired, without real desire as well with or without the ball. Coaching decisions are also involved while Pogba, Dembele, Thauvin, Lucas Hernandez and Ben Yedder’s entries didn’t bring anything more. The Colombians fully understood the state of mind of their opponent and so they came back progressively with a goal at the 62nd minute (2-2) followed by a third one at the 85th minute on a penalty after a stupid foul by Umtiti. 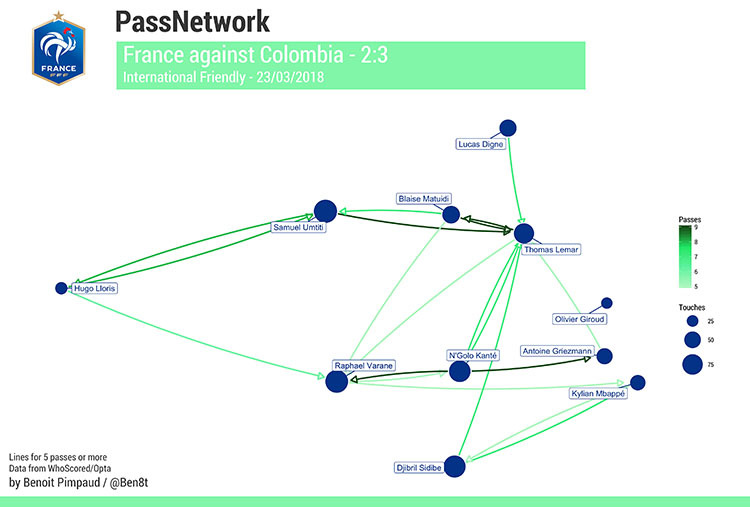 The passnetwork below show a little a bit how the Colombian block was not in fact very dangerous tactically, with concentrated midfield without connection with the attack. This bad spirit from the French is something very worrying in view of the World Cup. Here it’s “only” Colombia, what will happen to the big teams? The youth of the team can be an explanation while there are not that many experienced players (Koscielny is the most experienced one). However, all these young players are playing in big clubs each week, with more than half of the team having participated in the Champions League this season (Pogba, Rabiot, Matuidi, Dembele, Varane, Umtiti, Lloris, Sidibe, Mbappe or Tolisso just to names a few). Maybe the main problem with this talented team is that there are no real leaders. Colombian also probably overrated France. Looking at the difference of engagement between first and second half is very representative on how Colombian changed their mind and so their game. We have to keep in mind that Colombia reached the quarter final in the last World Cup (lost against Brazil) – James Rodriguez finished the best scorer with six goals – and so they are one of the teams that favourites should be wary. There are still some games before the World Cup, but the bulk of the strategy is already done. Colombia won’t probably change their approach, with an experienced group of players and a tactic that mixes fast attack and strong defensive abilities, as per classical South American teams. As we said earlier, there may need to be some small changes for France while there are still doubts on some positions (left-back and attacking organisation). With a young squad with a lot of talent, the French are one of the favourites for this summer. They just have to find the little extra thing (a real leader?) that could take them to the top.